August 29, 2018 at 10:51 am. 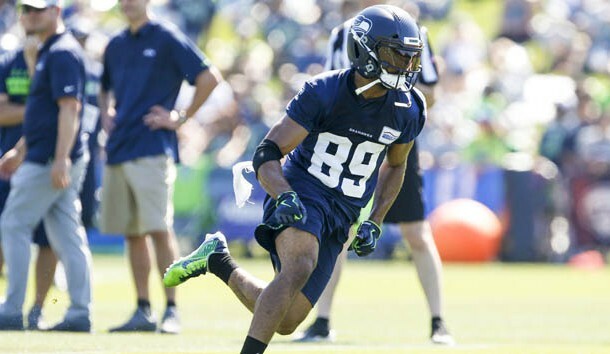 Seattle Seahawks wide receiver Doug Baldwin said he expects to enter the season with his knee at less than 100 percent. The injury isn’t likely to stop Baldwin from competing in the season opener against the Denver Broncos on Sept. 9. The 29-year-old returned to practice this week after being shut down for the past month with the injury. Baldwin said he first noticed the injury during organized team activities in May. He practiced for the first few days of training camp and didn’t feel right, prompting the team to shut him down. Fellow wideouts Jaron Brown, Tyler Lockett and Brandon Marshall would all see more targets should Baldwin miss time this season. Baldwin was named to the Pro Bowl as an injury replacement after he recorded a team-leading 75 receptions for 991 yards and eight touchdowns in 2017. It marked the third consecutive season with at least 75 catches for Baldwin, who set career highs with 94 receptions and 1,128 yards in 2016 while also earning Pro Bowl honors. Baldwin emerged as one of the league’s top wideouts in 2014 when he had his first 1,000-yard season (1,069) on 78 receptions while establishing a career best with 14 touchdown catches. An undrafted free agent out of Stanford, Baldwin has spent his first seven seasons with the Seahawks. He has 443 receptions and 44 touchdown catches while starting 77 of 110 games. Baldwin has appeared in 12 postseason games with Seattle, hauling in 55 catches for 702 yards and six touchdowns.